A swift-moving spring storm swept through Northern California the day preceding the April hike of the Sacramento County Hikers making way for an ideal day of hiking to Fairy Falls in the little known Spenceville Wildlife Area (SWA). SWA is located directly east of Beale Air Force Base and the Camp Far West Reservoir . 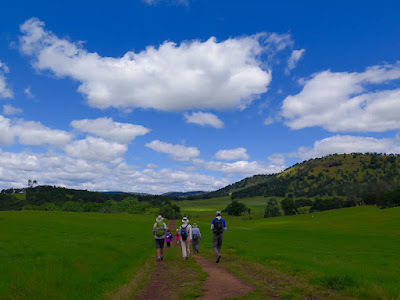 The temps were in the low 70s, the hills were green, the brilliant blue sky was full of puffy cumulus clouds and the trail was a moderately easy 2 1/2 miles to the water falls. It was literally a picture perfect day for a day hike. Sixteen hikers participated in today's hike organized by Rich Blackmarr.